The Hotel Association of Canada is the leading voice of the Canadian Hotel & Lodging industry, bringing legislative solutions to industry challenges. They deliver targeted advocacy for fair rules for the sharing economy, to address Canada’s hotel labour shortage, and for sustainability solutions for the hotel industry across Canada. Today, the hotel industry is facing some serious advocacy issues, including tax fairness in the short-term rental space and critical labour shortages, and HAC needs to take a leadership role. The Hotel Association of Canada, under new leadership, has built a strong national strategy to address both issues. You can learn more about HAC’s advocacy efforts by visiting their website and YouTube channel. To be effective in today’s political climate, lobbying efforts require strong research, well developed policies and issue papers, sophisticated messaging and positioning, smart digital strategies, grass roots engagement and an influential voice in the media. In order to make the kind of impact the industry needs on these issues, the association has restructured its membership model. Independent hotel properties that are members of Hospitality Newfoundland and Labrador can support the HAC in its efforts by choosing to pay an annual $2 per room fee collected by Hospitality NL and remitted in full to the Hotel Association of Canada. This fee will be collected in addition to Hospitality NL’s existing annual corporate membership fee with HAC. 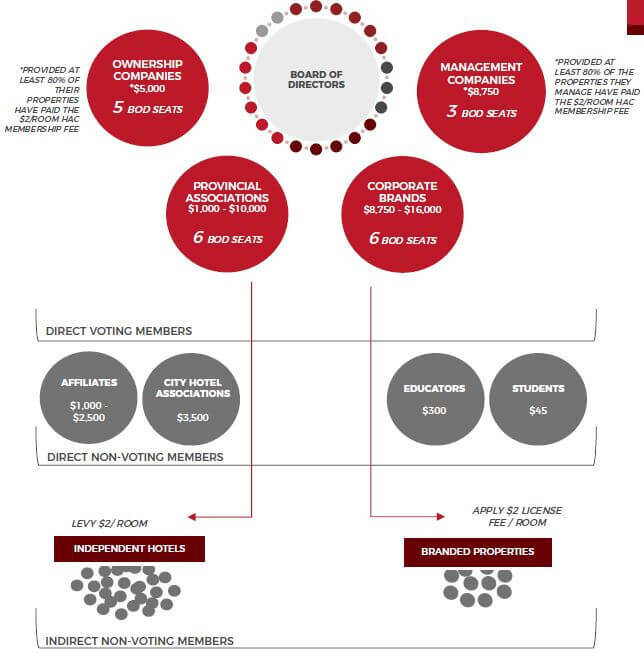 If you agree to support this fee, you will become a member of the Hotel Association of Canada in the non-voting Property-Level category, will receive its member communications and benefits, and will have the ability to dial in on the national policy agenda. With your support, HAC hopes to raise an additional $250k for the association in 2019. The fee will be applied on an opt-in basis, allowing independent owners a choice. Brand members of the Hotel Association of Canada will also be approaching their licensees to ask them to opt-in to this initiative. The deadline to opt in to HAC membership through Hospitality NL for the year 2019 is April 15, 2019. To learn more about how the new membership model works and the benefits of becoming a property-level member, check out the following resources.